A native New Yorker, George has resided in the Washington, DC, area for more than 20 years. It was in DC that George's fascination with magic was born. For many years, George haunted magic shops around the world. George's natural ability as a performer and the craft of magic fit together perfectly. 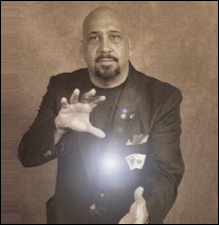 He worked with many renowned local magicians to hone his skills. Over the years, George has used his talents, including close-up, parlor, and stage magic to delight audiences. To prevent his shows from becoming stale, he has collected unusual magic from around the world, which make every performance unique and enjoyable. George's magic is not just your average pick-a-card magic tricks. He works hard to find uncommon tricks that you won't see at any run-of-the-mill magic show. Contact George Bradley in Silver Spring, Maryland, to have a well-known party entertainer amaze your guests with his exciting performance.